The Korean Society for Industrial and Applied Mathematics (KSIAM) announced Professor Kwak, Do Young as the winner of this year’s academic achievement award during its annual fall conference on November 2-4th in Jeju Island. Co-sponsored by the Geumgok Academy and Culture Foundation, the KSIAM-Geumgok Academic Award is the sixth of its kind since 2013. The awarding ceremony was held on the first day of KSIAM Annual Fall Conference 2018 on November 2nd. 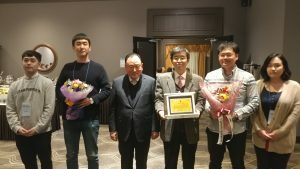 The award recognizes Korean researchers at home and abroad who have achieved significant distinction in such fields as applied and computational mathematics, and computational science and engineering. After graduating from Seoul National University for his undergraduate degree in mathematics, Professor Kwak went to the US and received his doctoral degree from the University of Pittsburgh in 1985. He joined KAIST in the same year, and over the past 33 years, has greatly contributed to the advancement of mathematical analysis as a researcher and an educator. His major research topics are multigrid methods, finite element immersed methods for elliptic problems, mixed finite volume methods for elliptic problems, curl element problems in Maxwell’s equations, and data synchronization in numerical weather prediction, among others. Professor Kwak, Do Young (the fourth from the left) poses together with Ha, Yeon Soon, the chairman of the Geumgok Academy and Culture Foundation, and students for a photo opp.